Joe Rogan had an engaging conversation with Elon Musk on his YouTube podcast Thursday night. The "Joe Rogan Experience,” as the show is called, is more stream consciousness conversation with guests and less traditional talk show. 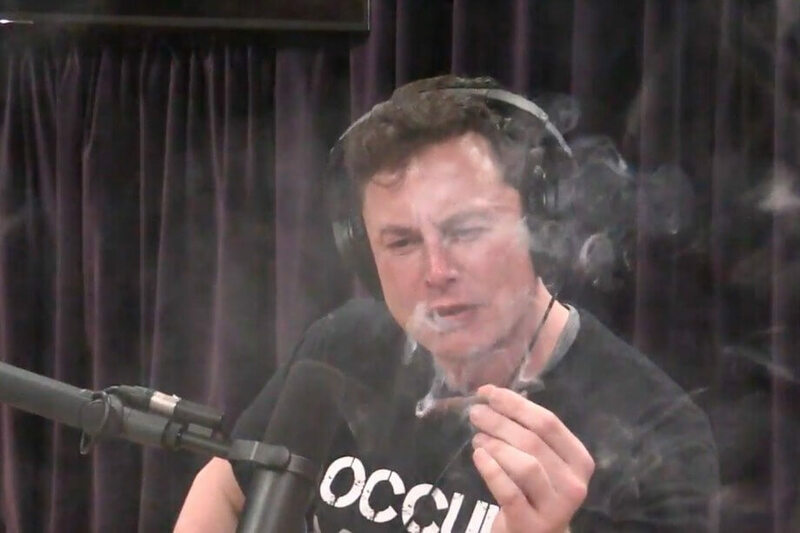 As Joe and Elon sat in the studio sipping whiskey and smoking weed (Musk only had one puff and didn't even inhale at 2:10:00), they wandered from topic to topic ranging from Musk’s business pursuits to his personal life. At one point Rogan asks him if he had ever thought about planes. “Yeah. I have a design for a plane,” said Musk almost as if it was a trivial matter. When pressed further the SpaceX boss seemed reluctant to spill any details. He had evidently only told his girlfriend and a few other friends about it. “I’m your friend,” said Rogan. Under pressure from the host, Musk described his idea for a vertical take-off and landing (VTOL) supersonic electric airplane. Rogan made the mistake of asking him how it would work and Musk lost him in the details and technical aspects. “I’m too stupid for this conversation,” Rogan whispered into his microphone. Even though Musk has put much thought into this plane design, he admits that it is not a priority. He has a lot of other things on his plate right now and thinks electric planes are not "necessary" at this time. His priorities lie with electric cars and sustainable storable energy solutions. While the electric plane may not be a priority for Musk at the moment, now that the proverbial cat is out of the bag, he might have to shift his attention to it before someone else steals his idea. As I see it, everything Musk says has to be taken with a grain of salt. It would not surprise me in the least if he walks this plane thing back, too, just like he's done with his satellite internet, Model 3, Mars Colony, taking Tesla private, and (did I leave anything out) other ideas. Supersonic? Right! VTOL? Right! The only thing supersonic is the hot air coming out of his orifices. He clearly enjoys the design phase of a new project. I can only assume he is somewhat annoyed with the logistics and manufacturing process though he may enjoy troubleshooting certain aspects. Thing about electric motors is their high torque starting from 'idle', a vertical take off isn't that surprising, I think he would have issues with the weight of the batterys for enough thrust to break the sound barrier, once that point the amount of energy required to go faster declines the further(speed) you are from Mach1(speed). Hey @captaincranky how correct you were: Musk in the video apparently says something to the effect of "his brain is like a never-ending explosion of ideas that he finds hard to turn off"! What was that you "imagined" he said? IMO, he did not need that joint. Man, this video is hard to watch because Musk seems totally out of it. My point was - he has little credibility. FROM Wikipedia: "Because mania and hypomania have also long been associated with creativity and artistic talent, it is not always the case that the clearly manic bipolar person needs or wants medical help; such persons often either retain sufficient self-control to function normally or are unaware that they have "gone manic" severely enough to be committed or to commit themselves. Manic persons often can be mistaken for being under the influence of drugs". An eletric ultrasonic airplane? What were you smo... oh. As to an electric VTOL supersonic plane, I highly doubt the technology is there yet - especially the energy storage aspect. Either Musk cannot see this, or this is yet another of his stunts to detract from the announcement of yet another top management exec leaving Tesla. He pulled stunts like this multiple times already WRT Tesla earnings reports and launching his Tesla on Falcon Heavy and other instances of SpaceX launches within days of Tesla earnings reports. As I see it, when Musk speaks people should not listen. So far, too many of his pie-in-the-sky ideas have had to be walked back. If he would actually deliver on his promises without all his yapping, he might regain some of his credibility. Like the man who he named his car company after, he may well go down into obscurity and only a select idea or two may survive. Right now, he appears to be walking toward a cliff and cannot see the cliff in front of him. The Minnesota Multiphasic Personality Inventory (MMPI) is a psychological test that assesses personality traits and psychopathology. It is primarily intended to test people who are suspected of having mental health or other clinical issues. One of the questions on the MMPI is, "Sometimes my mind races so fast I can hardly keep up". (Or similar, to the best of my recollection). It is designed to determine the manic state of an individual. An answer in the affirmative would indicate mania, to one degree or another. Mr. Musk, tacitly admits to being manic in the video topic of this thread. Note that being manic, IMHO, doesn't preclude that Musk is a sociopath and a pathological liar as well. His sociopathic / pathological tendencies, (again IMHO), are clearly evidenced by the fact Mr. Musk never admits to failure, but rather places the blame on factors and others beyond his control. All his diversions and misdirections place him as a graduate of, "The Harry Houdini College of Business Administration". He really should "come out of the closet", so to speak, and bring a platinum blond assistant, clad in a black Danskin and fishnets, to his press conferences. The amount of energy required only declines by virtue of lowered drag, commensurate with lower atmospheric density due to altitude. Note that all maximum achievable speeds published for supersonic aircraft are attained at or near, 50,000 Ft ASL. Ground level drag actually squares with a doubling of velocity. (IIRC, and assuming the same frontal area and profile). Not to mention the fact that the stall torque characteristics of electric motors would only allow them to bring the propellers up to speed faster than an equivalent ICE, or jet engine. The slippage loss from a jet engine is prodigious, until the air speed eventually syncs up with the exhaust gas velocity. That said, an electric driven propeller or impeller system, would have virtually identical losses. All attempts at supersonic flight with propeller driven craft have essentially failed thus far. The reason being to exceed the speed for sound, mandates the the propeller tips exceed the speed of sound as well, creating "sonic booms" at the ends of the blades. Who knows, maybe Musk will talk a larger company out of the money to build one of his "gigafactories", to produce extension cords several thousand miles long, with the ability to withstand supersonic flight. Kind of like the robots in Evangelion with extension cords? @captaincranky No doubt whatsoever in my mind Musk has lost it; it's obvious. To me, he lost it several years ago already - when, or much before, he suggested sending people to Mars with no return plan. He has been, and obviously is, to me at least, totally insane. It really is a case of "I fart more ideas out my a$$ than the average human has in their mind in an entire lifetime" and so far, most of his ideas are not worth much more than the average fart. I'm predicting Tesla - the car manufacturer - will be eclipsed by those companies like Toyota and others who have taken their time in bringing electric cars to market because they understand that the technology needs improvement - not the least of which - electrical storage. Toyota has been working for many years on improved battery technology. Musk is simply pulling the average rechargeable lithium AA battery off-the-shelf because he thinks it is good enough. While his results are OK, they are not in the least extraordinary. Even with Musk's announcement of a Tesla with increased range, my bet is that others, who are doing real research with paid scientists in real laboratories rather than building sand castles in their backyard sandbox, will beat Tesla and Musk to market with EVs that have significantly more range and are far more reliable. And an electric VTOL supersonic plane is not happening in the near future, perhaps not in the next 100 or more years, for many more reasons than electrical storage. Like you have said before, Musk is living in a sci-fi fantasy land. Everything Musk says should be taken with a large grain of salt if not discounted entirely. Just because he is supposedly among the super-rich means less than nothing. I predict his ultimate demise - not necessarily much of a difference from what happened to Nikolai Tesla. Actually I was just having this discussion about Musk. Personally, I think he is autistic -- specifically Asperger’s Syndrome, which is high functioning. My son has Asperger’s and Musk totally has the same mannerisms -- reluctance to make and maintain eye contact, certain facial movements and expression, the way he speaks (hesitantly is the easiest way to describe it , but it's more than that), and watch his hands. When he is not consciously using them to gesture, he tends to hold them in a controlled position. Asperger's tend to exhibit involuntary movements in the extremities especially when excited, agitated, or nervous. It's called stimming. It can be a bit disruptive if you are trying to have a conversation with someone, so those with Asperger's often make a physical effort to control their stimming. My son will sit on his hands if he is sitting and will cross them if he is standing. Take a minute to watch Musks hands when he talks to Rogan. When he is not expressly using them to gesture, he has them crossed on the table and you can see them twitch every so often. captaincranky and wiyosaya like this. OK, not being much, if at all, a fan of anime, you lost me with that one. However, I always associate anime with former Japanese race queen Midori Yamasaki, who possesses the cheekbones that launched a thousand cartoons! She's also way more better looking than Elon Musk too. (Just trying to keep this on topic ). That's an interesting observation, IMO. I had not thought of him as having Asperger's. That would go a long way as to what I perceive as his disconnect from reality - and his lack of what I'll call "social grace" in saying things like Mars colony applicants should not expect to return. Though I am not qualified to diagnose anything, I would not go so far as to say that he also has savants syndrome. The way that I see it, he is under intense pressure to deliver right now. He seems like he is constantly scrambling for the next thing that he can pull out of his bag of tricks that will actually succeed. He has had successes, but all eyes are on him and Tesla and what Tesla will roll off that production line. Nothing in the news about any of his companies is of a spectacular nature. SpaceX is launching satellites, but there's nothing really innovative coming from any of his companies at this time - at least IMO. Time will tell where it goes, but I still think that other automakers, even though they do not have EVs currently on the market, will pose big problems for Tesla in the future. To me, this is an example of a well-thought-out plan - far better than what Musk has proposed. As I see it, it also shows the quality of thought needed for an endeavor like this. As I see it, it reinforces my position that at least some of Musk's ideas are not worth much. The truth of the matter is, all of the range deficiencies and logistic issues of electric vehicles have already been solved with modern hybrids. Hybrids are the perfect segue to an all electric transportation, which add electric vehicle infrastructure as it is needed, not on somebody's whim and whine. Nobody, or rather no government, is going to kowtow to Musk to the extent where they revamp the entire electric grid, fuel supply, and, and building codes to force retrofitting of all existing buildings, so that this a**hole Musk, can sell more Teslas. True dat! Air is air, and we move through in the manner which it allows, or rather dictates. The earth's atmosphere is not likely to begin to reorganize itself to accommodate Mr. Musk's "pipe dreams" either.. I just think the D-bag is taking Tesla's name in vain, period. The interesting thing here is, "Asberger's Syndrome", was removed for the phychiatric diagnostic manual several years ago. Which is not in any way say you don't have issues with your son, or there is no such thing as "high functioning autism". The problem was, that Asberger's diagnostic profile was broad enough to allow people who also fell within the range of accepted "normal behaviors", to fake it, and make medical & disability claims for treatment of it. FWIW, cocaine and methamphetamine also make a person fidgety in the extreme. Given a snoot full of either compound, does tend to make a person not know what to do with their hands, particularly when in full public view. As for not being able to "make eye contact", that's also a salient symptom of lying. With that said, I should probably retract my assertion that Musk is, "a sociopath and a pathological liar", and simply observe that, IMHO, he's only a sociopath. ...[ ]...Though I am not qualified to diagnose anything, I would not go so far as to say that he also has savants syndrome. Dude come oe, Musk's behavior has nothing to do with savant syndrome.. Think back to "Rain Man", A savant is typically someone who needs a caretaker, but can tell you the phase of the moon on any given date, 3000 years in the future. At least that's how I understand it. Besides, the term "savant" has been excised from the politically incorrect but former full clinical terminology, which was, "id!ot savant". As I said earlier, the perfect transition vehicles are available now, hybrids. People aren't buying them in the quantity they should either. Yes, I agree. If you ask me, he shows nothing out of the ordinary in terms of engineering/science skills. - That was my point. Have a look at this guy - https://en.wikipedia.org/wiki/Daniel_Tammet I saw a profile on him somewhere, probably PBS or something similar, and while he is known to have savant syndrome, you would not know it due to the fact that he is very high functioning. He learned conversational Icelandic in a week. Icelandic is supposed to be one of the most difficult languages to learn. This guy is about as far from Rain Man as Musk is from Nikolai Tesla. Yet language is not his only skill. He is quite an interesting person, IMO. True enough - but I did my part and will again the next time I buy.